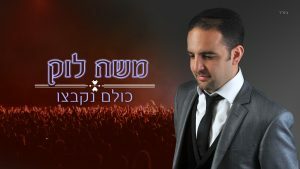 In preparation for the great event of receiving the blessing of Maranan and Rabbanan shlit on the upcoming Chag Pesach, singer and cantor Moshe Louk recited the anthem “Kulam Nikbetzu,” written and composed by Eli Klein & Yitzy Berry. Under the intense impression of last year’s status and the feelings that accompanied him, Louk decided to resume the song and add his spice and aroma. With Maestro Moishe Roth from the “Hamenagnim” orchestra, and the result is before you!